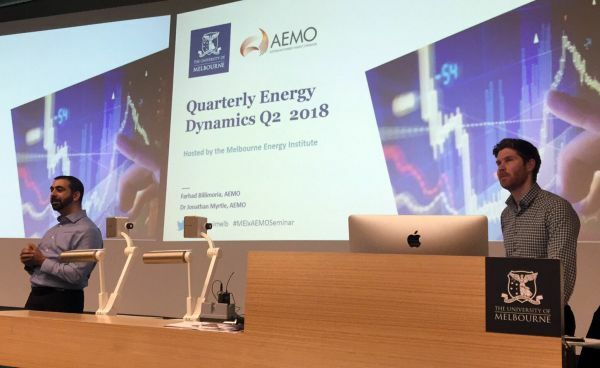 On 5th September, the Australian Energy Market Operator's (AEMO) spoke about their most recent Quarterly Dynamics report. Every quarter AEMO undertakes analysis of energy market dynamics, highlighting trends and outcomes experienced by the NEM and gas markets. The latest report covered 1 April to 30 June 2018 and was presented by AEMO’s Farhad Billimoria, Senior Markets Analyst, and Dr Jonathan Myrtle, Senior Energy Market Analysts. Key findings discussed included drivers of declining wholesale electricity and gas prices across most regions, key changes in the electricity supply mix including hydro generation, and higher wind and solar generation. The Melbourne Energy Institute hosted the seminar, as well as the previous report earlier this year, at the University of Melbourne. To access the slides used during the presentation click here.